Colour is a subjective psycho physiologic interpretation of the visible electromagnetic spectrum. Luminous sensations or images, produced in our retina, are sent to the brain and interpreted as a set of monochromatic sensations which constitute the colour of the light. The sense of sight does not analyze each radiation or chromatic sensation individually. For each radiation there is a colour designation, according to the frequency spectrum classification. It is important to indicate that objects are distinguished by the colour assigned depending on their optical properties. Objects neither have nor produce colour. They do have optical properties to reflect, refract and absorb colours of the light they receive, that is to say: the set of additive monochromatic sensations that our brain interprets as colour of an object depends on the spectral composition of the light that illuminates such an object and on the optical properties possessed by the object to reflect, refract or absorb. Newton was the first one to discover the decomposition of white light in the group of colours that forms a rainbow. When a white light beam went through a prism, the same effect as that indicated in above Figure 1 was obtained. consists in a radiation integrated by small wavelength intervals which may be called emission peaks. Each gas has a wavelength characteristic of its own radiation which depends on the gas molecular structure through which discharge takes place. This kind of discharge is usually called luminescence and it is characterised by temperature independent radiation types. The most common luminous sources or discharge lamps are fluorescent tubes: high pressure mercury, high pressure sodium and induction ones. As for incandescence, the spectroradiometer is used to obtain the spectral distribution curve. The spectroradiometer function obtained is indicated in Figure above. Wavelengths in nm. are placed in the abscissas, and values related to energy, with respect to the maximum radiated understood as 100%, are placed in the ordinates. Also, the specific potency in mW/nm.wavelength is usually given in the ordinates. Thank you for this excelent document, despite there are lighting software simplifying calculations it is very important to understand the data results, this handbook helps to do this. thanks for the data you guys. My question is can we control the impact of lightning which cause power outage total in power system. Why i can’t download your pdf files. electrical designing methods and formulas for commercial, domestic, hospitals and outdoor. Love the info you guys put out. I’m a 3rd yr electrical apprentice and am loving it. 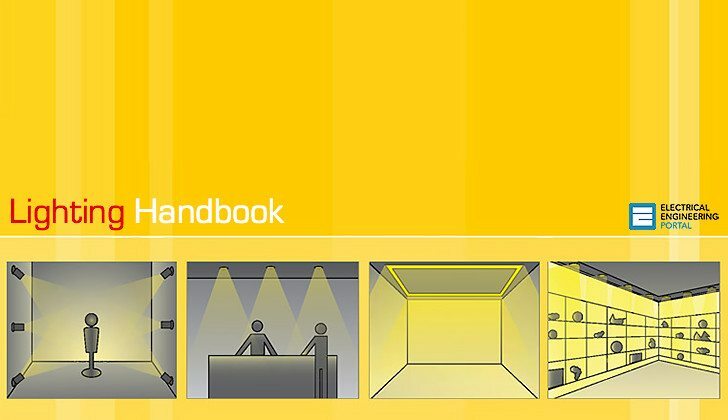 An extremely wonderful book I ever seen in lighting engineering. Thank you EEP and members.